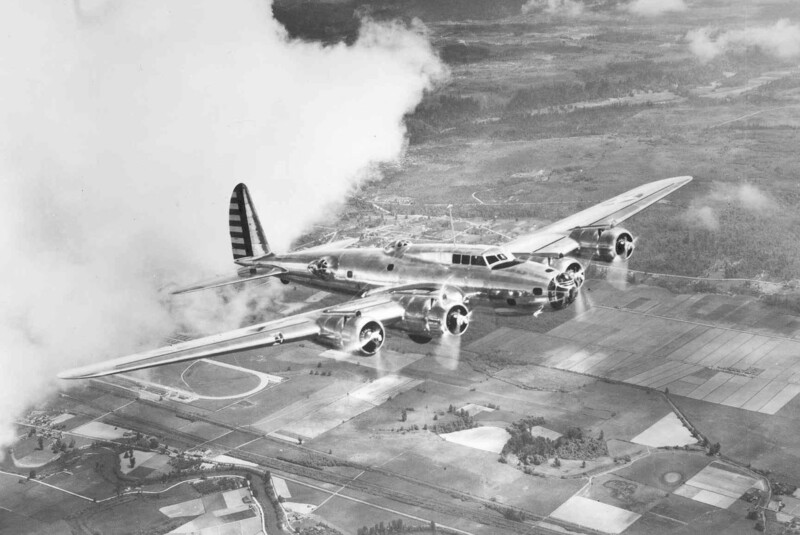 12 May 1938: Three Boeing B-17 Flying Fortress four-engine bombers of the 49th Bombardment Squadron, 2nd Bombardment Group, departed Mitchel Field, Long Island, New York in heavy rain and headed eastward over the Atlantic Ocean. 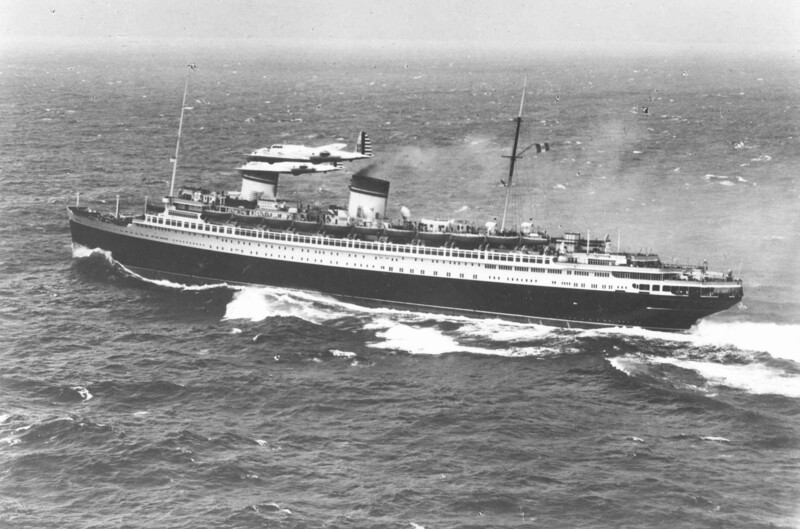 Their mission, assigned by Major General Frank M. Andrews, commanding General Headquarters, U.S. Army Air Corps, was to locate and photograph the Italian passenger liner, S.S. Rex, then on a transatlantic voyage to New York City. The purpose was to demonstrate the capabilities and effectiveness of long-range bombers. The flight was led by Major Caleb Vance Haynes, commanding officer of the 49th Bombardment Squadron, flying B-17 number 80. The 2nd Bomb Group commanding officer, Lieutenant Colonel Robert Olds, was aboard Haynes’ B-17, along with an NBC radio crew to broadcast news of the interception live across the country. Reporters from the New York Times and the New York Herald Tribune were aboard the other airplanes. 1st Lieutenant Curtis Emerson LeMay, Air Corps, United States Army. 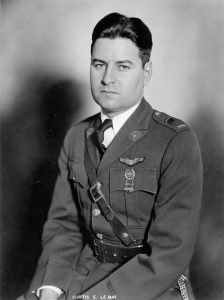 The planning of the interception and in-flight navigation was performed by First Lieutenant Curtis E. LeMay. Position reports from SS Rex were obtained and forwarded to LeMay as the aircraft were taxiing for takeoff. The flight departed Mitchel Field at 8:45 a.m. They encountered heavy rain, hail, high winds and poor visibility, but at 12:23 p.m., the Flying Fortresses broke out of a squall line and the passenger liner was seen directly ahead. They flew alongside the ship at 12:25 p.m., 620 nautical miles (1,148.24 kilometers) east of Sandy Hook, New York. They were exactly on the time calculated by Lieutenant LeMay. The B-17s made several passes for still and motion picture photography while NBC broadcast the event. Colonel Olds would rise to the rank of Major General and command 2nd Air Force during World War II. He was the father of legendary fighter pilot Brigadier General Robin Olds. Major Hayes served in various combat commands and retired at the rank of Major General in 1953. Curtis LeMay would be a Major in command of the 305th Bombardment Group, a B-17 unit, at the beginning of World War II. He personally led many combat missions over Europe, and would command the 4th Bombardment Wing and then the 3rd Air Division. By the end of the war, he was in command of the XXI Bomber Command based in the Marianas Islands. From 1948 to 1957, General LeMay commanded the Strategic Air Command, then served as Vice Chief of Staff of the Air Force. From 1961 to 1965, LeMay was Chief of Staff. At the time of the interception of the Rex, there were only 12 B-17s in the Air Corps inventory: the original Y1B-17 development aircraft. By the end of production in 1945, 12,731 B-17 Flying Fortresses had been built by three aircraft manufacturers. 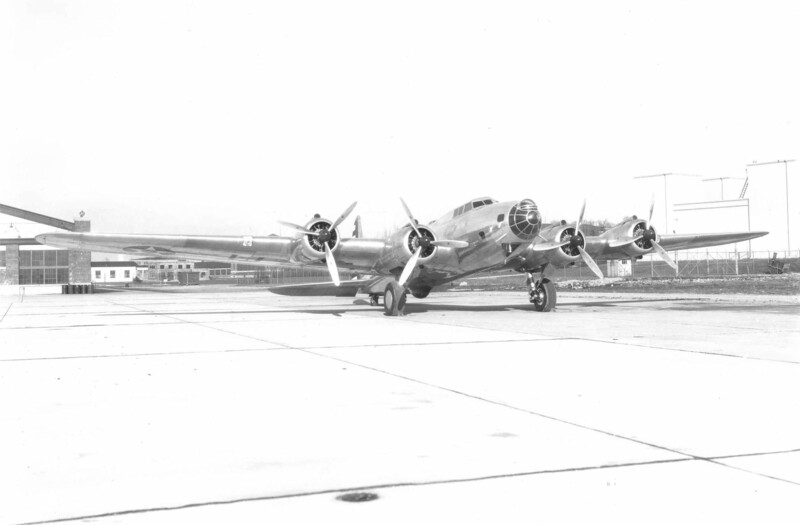 The Boeing B-17 (Model 299B, previously designated Y1B-17, and then YB-17) was a pre-production service test prototype. Thirteen had been ordered by the Air Corps. It was 68 feet, 4 inches (20.828 meters long with a wingspan of 103 feet, 9⅜ inches (31.633 meters) and the overall height was 18 feet, 4 inches (5.588 meters). 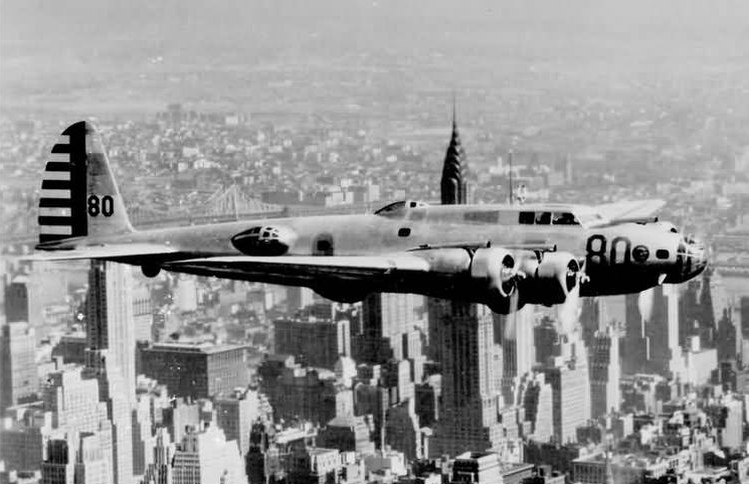 The YB-17 was powered by four air-cooled, supercharged 1,823.129-cubic-inch-displacement (29.876 liter) Wright Aeronautical Division Cyclone G59 (R-1820-51) nine-cylinder radial engines with a compression ratio of 6.45:1. The R-1820-51 had a Normal Power rating of 800 horsepower at 2,100 r.p.m. at Sea Level, and 1,000 horsepower at 2,200 r.p.m. for Takeoff, burning 100-octane gasoline. A long carburetor intake on top of the engine nacelles visually distinguishes the YB-17 from the follow-on YB-17A. The engines drove three-bladed Hamilton Standard constant-speed propellers through a 0.6875:1 gear reduction. The R-1820-51 was 3 feet, 9.06 inches (1.145 meters) long and 4 feet, 6.12 inches (1.375 meters) in diameter. It weighed 1,200.50 pounds (544.54 kilograms). 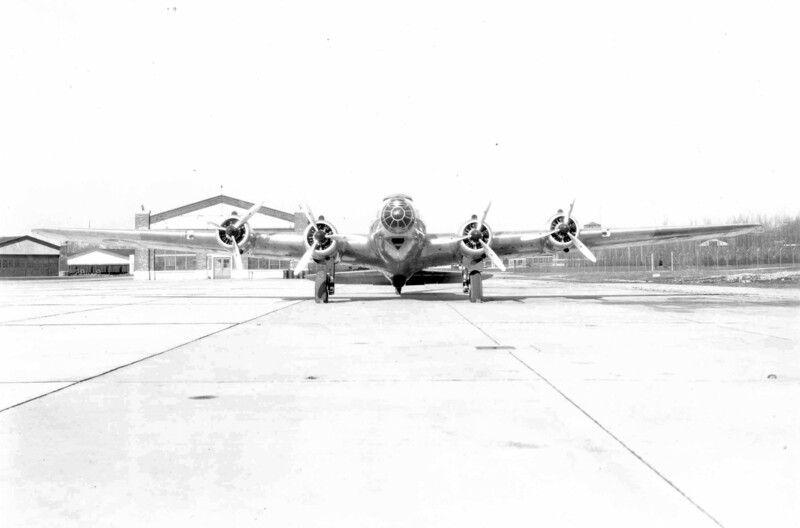 The YB-17 had an empty weight of 24,465 pounds (11,097 kilograms), gross weight of 34,880 pounds (15,821 kilograms) and maximum takeoff weight of 42,600 pounds (19,323 kilograms). The maximum speed was 256 miles per hour (412 kilometers per hour) at 14,000 feet (4,267 meters). Its service ceiling was 30,600 feet (9,327 meters) and the maximum range was 3,320 miles (5,343 kilometers). 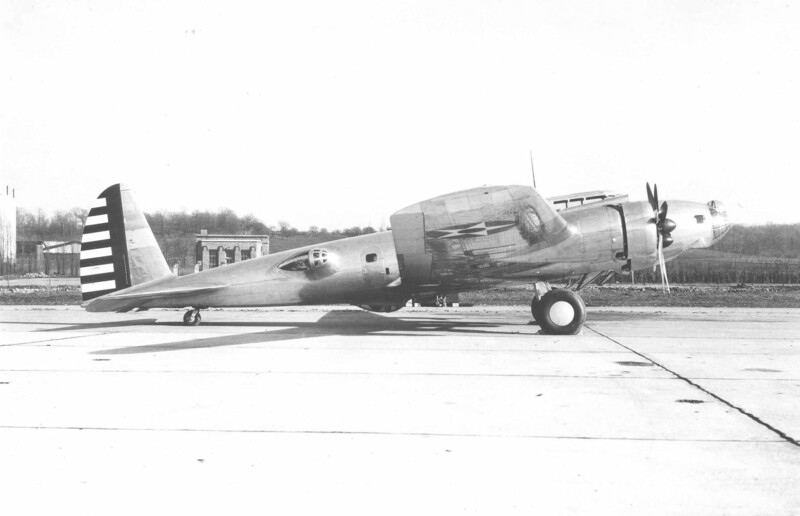 The YB-17 could carry 8,000 pounds (3,629 kilograms) of bombs. Defensive armament consisted of five air-cooled Browning .30-caliber machine guns. Very informative site, I found it in the course of doing some research on helicopter pioneer Anton Flettner for possible use in a biography aimed at young readers. and some other sources also say he was Kaman’s “chief designer”. However, when I contacted Kaman about Flettner the only thing they knew about him was from a brief reference in a 1985 company history that acknowledged his having developed the first mesh rotor, but did not identify him as a company employee at all, although there was a picture of him with Charles Kaman. I’m trying to find out more about Flettner’s career and life in the US post-WWII and to clear up some of the apparent discrepancies in accounts about his relationship with Kaman. That is interesting, Mr. Bartley. I think that you already know more about Mr. Flettner than I do. We can be sure that Dr. Flettner designed the Colibri “synchropter.” There is a lot of conflicting information about his relationship with Kaman. I will be interested to read your conclusions in the matter. Thank you.